When I was an entomology student, I learned that flies in the family Syrphidae are called “hover flies,” due to their habit of hovering in front of flowers, and that the larvae are predators of aphids. As is the case for nearly every other group of insects, I now know that there are exceptions–often many—to the typical rule, and the fly shown in the above photograph is a perfect example of such. Being a beetle-man (and a wood-boring beetle-man, at that), I don’t generally notice flies unless there is something unusual about them. This fly was seen last summer at Sam A. Baker State Park in southeastern Missouri on the trunk of a very large, recently wind-thrown mockernut hickory (Carya alba) tree. I had never seen a fly quite like this before, but everything about it suggested an intimate association with dead wood, including its relatively large, hulking, black form and the way it repeated returned to and landed on the trunk of the dead tree each time I disturbed it. 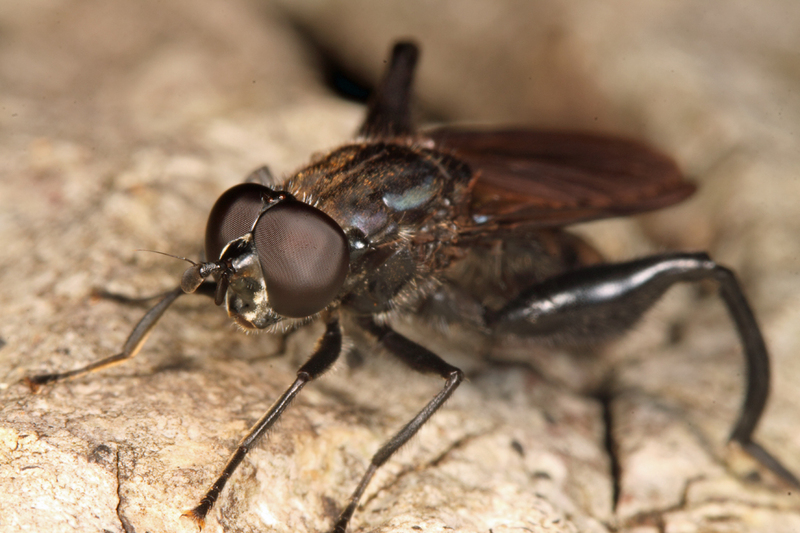 It instantly made me think of robber flies in the subfamily Laphriinae, which includes Andrenosoma fulvicaudum and many species of Laphria that, as larvae, tunnel through dead and decaying wood where they prey upon the larvae of wood-boring beetles. While it was quite obvious that the fly in the photo was not a robber fly, imagine my surprise when I eventually determined it to be a member of the family Syrphidae. For now I’ve provisionally settled on the genus Chalcosyrphus, although it lacks the steely blue cast exhibited by the only all-black species of the genus—C. chalybeus—shown on BugGuide. Another species, C. piger, looks very similar but seems always to have some red on the abdomen, which this individual definitely lacks. Perhaps the related genus Xylota is also a possibility, although the “gestalt” does not seem to quite match that of any shown on BugGuide. Most interesting for me are the distinctly enlarged and toothed metafemora, which along with the correspondingly curved tibiae suggest some predatory function, but the literature that I have seen makes no mention of such, but rather that the adults feed on pollen. My hunch about its association with dead wood does seem to be true, although it now seems the larvae are saprophages rather than predators within the wood, as I first imagined. This entry was posted in Diptera, Syrphidae and tagged entomology, flies, insects, Missouri, nature, science. Bookmark the permalink. 5 Responses to T.G.I.Flyday – Chalcosyrphus? Nice. In NC I’ve seen C. piger (males, presumably) making those flights off of sun-lit rocks as well as my deck railing. A form of hill-topping? I’m not sure how to tell Xylota from Chalcosyrphus. Both seem to have spines on the metafemora, but maybe in Chalcosyrphus, a few are much longer? (Some images on BG seem to show this difference.) Thought I saw a key or BugGuide comment differentiating them somewhere, but can’t find it now. BugGuide flies could always use work, especially adding keys to guide pages. A great project for retired entomologists, perhaps! Some of the references I found distinguished Xylota and Chalcosyrphus by the bare (former) or pubescent (latter) metasternum, which isn’t visible in this or any of the other photos I have. I’m happy with having gotten as far as possible on my own. I hope a fly guy can offer some insight into the purpose of those spiny metafemora – perhaps a sexual function? Well thanks! He loves bugs and being outside – He’s been fascinated with them since he was a tiny tot.